With Rashad Whack leaving the program and it being spring we cannot help but talk more about recruiting. I agree with most of you that I love to see a big man be added to the mix for the next season but that wish might not be realistic at this point. The coaching staff is surveying all options but it really comes down to finding the right fit for the program. If they cannot find it in a spring signee, they will hold on to the scholarship for next season. Still though, I'm sure the coaching staff isn't worried much about next season's roster when you factor in Sherrod Wright returning and the development of some of the reserve players we saw over the year. 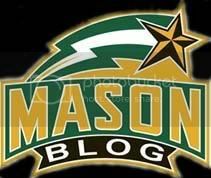 I noticed this morning that George Mason was one of the schools who had staff attending a workout for 2011 recruit Joseph Uchebo. Uchebo is a 6'9" 240-pound center who was originally committed to NC State but was granted a release following the departure of head coach Sidney Lowe. No idea what Mason's chances would be of getting a kid like him but keep in mind that most other BCS schools have full rosters already set for next year and you never know if the Patriots could be the most appealing option at this point. Rivals.com calls him a double-double machine and rebounding seems his biggest strength. I think it's safe to say there isn't a Mason fan out there who wouldn't want to see this kid joining the Patriots' front court next season. For 2012 recruits I've been told by Alex Kline from The Recruit Scoop that the George Mason coaching staff "loves Georges Niang". He visited Mason back in December but has since gained a lot more attention on the recruiting scene. Niang, at 6'7" 235, is another recruit with size that the Patriots could use. He went on visits to Iowa and Iowa State last month so it appears another under the radar recruit the staff was following could be scooped up by the bigs. Last year we were less than a mediocre rebounding team, our coaching staff is definitely on the right track to push this team to another level next year. In all seriousness, though, I think he could develop nicely at Mason. He'll have just enough competition to push him (Morrison, Aldridge, Johnny Williams) but if he works hard and rounds into shape he will get serious minutes next year. Guys like this make the difference come tournament time (just ask VCU about Jamie Skeen). I love Ryan Pearson but he's undersized and unless Aldridge has recently developed more than we know he desperately needs more help inside and it definitely showed by the end of last season. Niang I'm not as excited about. He looks like a big bruiser but not particularly strong or fast and with limited upside. If Iowa or Iowa State gets him I don't think we suffer much. Heck, if we're looking at big guys maybe we should see if we can't steal Nerlens Noel (like I said, we should have that mentality even if it's "unrealistic"). We're a young, exciting, up-and-coming school with a great, proven, committed coach and growing program and growing conference. We're a dark horse recruiters at big schools worry about. As usual it is so imperative that the guys we have work hard over the summer. The staff knows that what we need is out there. If we think about it we have been competitive almost every year with great results. That is a sign of hard work from all the coaches. They also know what we do not need is a pampered ,spoiled,lazy player who is a legend in his own mind. Side note-the hotel in Cleveland where the Mason team stayed said they were the best group of young men they had seen. That came from housekeeping and others. I know that is part of the profile that the staff expects to represent GMU. I am sure we can live with that and hope the new players really fit our needs.